Biliary radiofrequency ablation (RFA) using the Habib™ EndoHBP catheter is a new endoscopic palliation therapy for malignant biliary obstruction. The aim of this study was to assess the feasibility and safety of this technique. In this nationwide retrospective study of prospectively collected clinical data, all patients treated by biliary RFA in Austria between November 2010 and December 2012 were included. Procedure-related complications, adverse events within 30 days post-intervention, stent patency, and mortality rates were investigated. 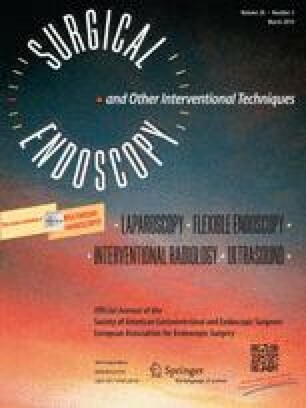 A total of 58 patients (31 male, 27 female, median age 75 years) underwent 84 RFA procedures at 11 Austrian referral centers for biliary endoscopy. The predominant underlying condition was Klatskin tumor (45 of 58 cases). All 84 RFA procedures were feasible without technical problems. A partial liver infarction was induced by RFA in a 49-year-old Klatskin tumor patient. During 30 days after each RFA procedure, five cases of cholangitis, three cases of hemobilia, two cases of cholangiosepsis, and one case each of gallbladder empyema, hepatic coma, and newly diagnosed left bundle branch block occurred. Median stent patency after last electively performed RFA was 170 days (95 % CI 63–277) and was almost significantly different between metal and plastic stenting (218 vs. 115 days; p = 0.051). Median survival was 10.6 months (95 % CI 6.9–14.4) from the time of the first RFA in each patient and 17.9 months (95 % CI 10.3–25.6) from the time of initial diagnosis. Except for one severe interventional complication (hepatic infarct), RFA presented as a technically feasible and safe therapeutic option for the palliative treatment of malignant biliary obstruction. The good results of stent patency and survival in this study should be proven in prospective (controlled) trials to further quantify the efficacy of this promising new technique. This study is conducted for the Austrian Biliary RFA Study Group. The online version of this article (doi: 10.1007/s00464-013-3232-9) contains supplementary material, which is available to authorized users. The authors would like to acknowledge the following people who substantially contributed to the data collection in the context of this study: Barbara Tribl, Patricia Kump, Wolfgang Vogel, Brigitte Hellmich, Antje Holzäpfel, Michael Wasilewski, Isolde Hinterberger, Franz Siebert, Andreas Maieron, Rainer Schöfl, Johann Pidlich, and Karl Dam. Werner Dolak, Florian Schreiber, Hubert Schwaighofer, Michael Gschwantler, Wolfgang Plieschnegger, Alexander Ziachehabi, Andreas Mayer, Ludwig Kramer, Andreas Kopecky, Christiane Schrutka-Kölbl, Gernot Wolkersdörfer, Christian Madl, Frieder Berr, Michael Trauner and Andreas Püspök have no conflicts of interest or financial ties to disclose. This study did not receive any public funding or industrial sponsoring.